1. Preheat the oven to 200°C, gas mark 6. Toss the tomatoes, ½ tbsp oil, 1 tbsp water, the vinegar and the thyme in a small roasting dish. Season, then roast on the middle shelf of the oven for 8-10 minutes, until softened. 2. Meanwhile, set a non-stick omelette or frying pan (about 20cm in diameter) over a medium heat. Beat the eggs with a fork; season lightly. Add the remaining ½ tbsp oil to the pan, then add the eggs, swirling now and again, until the omelette is just set all over. 3. Transfer to a plate and spread most of the Philadelphia over ½ the omelette (the heat of the omelette should help it spread more easily). Pile the rocket leaves and tomatoes on top and spoon over the remaining Philadelphia and any juices. 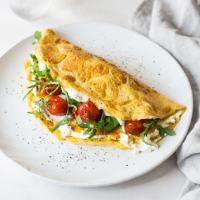 Fold over the omelette to serve. This is a brilliantly quick veggie meal for one, but it can easily be doubled to serve two.